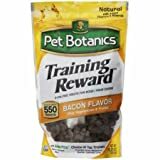 What kind of treats to use for Dog Training? Can you get Vegan Dog Training Treats? 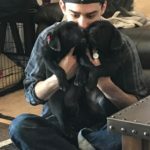 Best Dog Treats for Training Puppies? Searching for the right brand of dog treats can be a very long process. 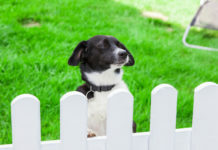 How do you know what’s right for your dog? You know you want to reward them, but is feeding them bland, nutrition-lacking dog biscuits really the best option? Healthy dog treats are just as important as healthy dog meals, and shouldn’t be overlooked. Throughout this article, we want to show you some of the healthiest and most delicious dog treats for your furry friend. Instead of buying the generic brand, unhealthy filler, check out some of the nutritious delights that we’ve listed below. We’ve searched all over the internet and researched tons of dog blogs to find what’s best for your dog. When it comes down to it, our dogs are our family members, and we should treat them as such. Through all of our searches, we’ve found what we believe to be the top 10 best dog treats for training. While training, you may wish to invest in a useful training book for your dog. 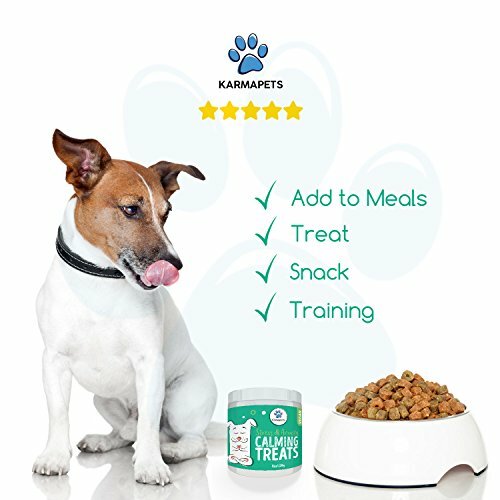 The KarmaPets natural dog treats are some of the best relaxing snacks for your dog. They don’t cause unwanted drowsiness or nausea like some of the other brands of dog treats. 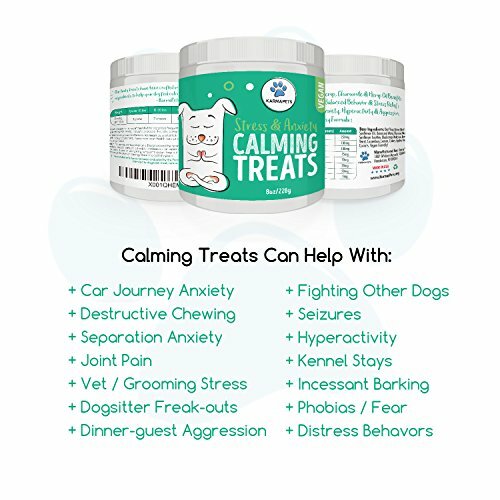 If you’re looking for a natural stress-relieving treat for your dog, these ones are always a great option. 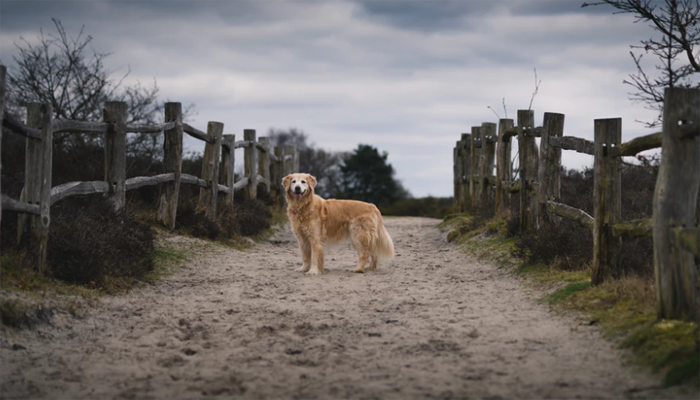 Feeding your dog healthy food (treats included) without loads of artificial preservatives and fillers is a fantastic way of lengthening their lifespan. These vegan and organic dog treats don’t allow any extra chemicals or unwanted artificial preservatives in their recipe dog treats. This ensures that your dog will be healthy and relaxed naturally. How do They Help with Training? When puppies are first training, there’s a lot of stress involved in breaking the human-to-dog barrier. 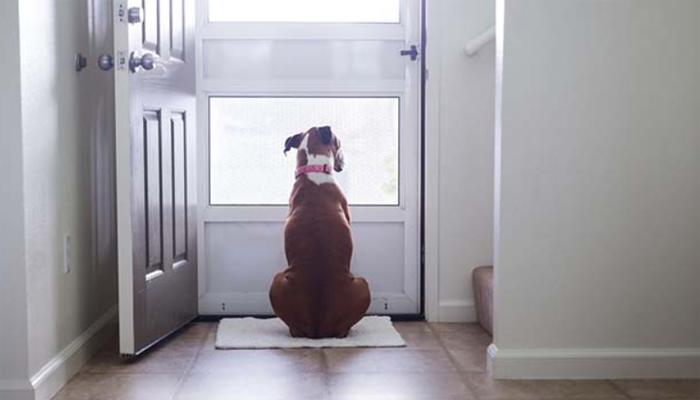 Although training might seem like a normal activity to you, dogs can have unnecessary stress. It’s always important to look after your little friend and to make sure they’re comfortable with the process as well. 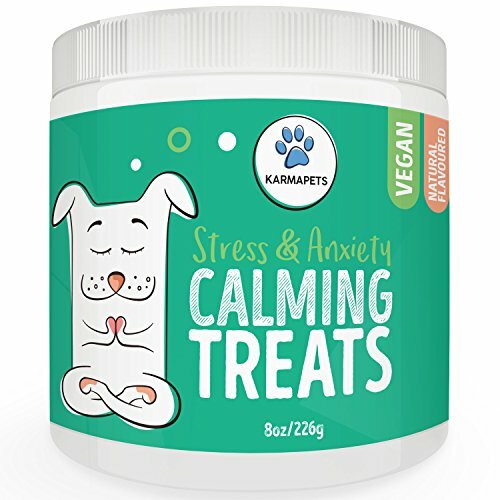 KarmaPets Calming Treats for dogs naturally adjusts your dog’s brain chemistry to understand that these processes are normal and shouldn’t be stressful. Why We Liked Them – These organic vegan dog treats don’t allow any extra chemicals or unwanted artificial preservatives in their recipe. This ensures that your dog will be healthy and relaxed naturally. You may be interested in a dog-friendly Melatonin supplement which can help to calm your pup, also. Zuke’s Mini Naturals healthy moist training treats come with multiple healthy ingredients to keep your dog healthily energized and ready to train. There are all kinds of delicious dog food that make up these little treats. One of the most impressive facts about these treats is that they’re made without fillers like wheat, corn, and soy which are all common in most dog treats. 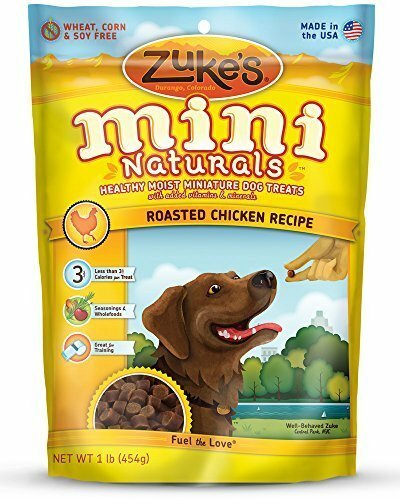 These Zuke’s Mini Naturals healthy moist training treats come with chicken, duck, peanut butter, or pork as their #1 ingredients depending on the recipe you choose. Instead of a flavorless base, Zuke’s Mini Naturals uses flavorful protein. They also feature other healthy ingredients such as cherries and turmeric. Both of these ingredients are widely known to increase a dog’s healthy, happy lifestyle. Many other dog treats brands load up on the calories with carbs to fill your dog’s stomach. While this might not seem like that big of a deal, dogs don’t need nearly as many calories as we do. For this reason, Zuke’s Mini Naturals healthy moist training treats come with only 3 calories per treat. Instead of packing on the weight, these low-calorie treats are incredibly nutritious and healthy. Why We Like Them – Using real protein as the first ingredient in your dog treats is an excellent choice. 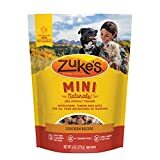 Zuke’s Mini Naturals healthy moist training treats are some of our favorite training treats and allow you to pick between multiple sources of protein to allow you to decide what’s best for your dog. The peanut butter ingredient is hugely popular with dogs, too! 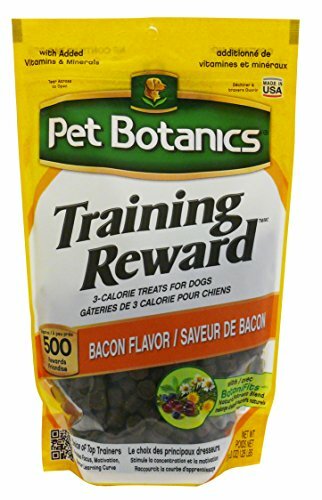 When it comes to training your dog with treats, Pet Botanics Training Reward dog treats are some of the best. They’re very small, which makes them a perfect training treat. Why might you ask? Because when you train your dog, you want to give them plenty of mini rewards. Too many large treats can upset their stomach and cause unhealthy weight gain. The ingredients in these world favorite training rewards treats are amazing, but let’s start with what’s not in them. There are no fillers like corn and soy, which many other brands carry. Fillers are bad for two reasons. 1) They’re tasteless for your dog, and 2) they lead to unwanted weight gain. Fillers are also a cheap way for companies to charge you more money. Pet Botanics Training Reward treats start with pork liver as the number one ingredient. Dogs need protein for healthy muscle growth, which make these training treats an excellent choice. These healthy treats for dogs also have dried eggs, sweet potato, bacon, and a load of vegetables to keep your dog healthy and attentive. Why We Like Them – The pork liver dog treat are packed with vegetables to enhance your dog’s energy levels and cognitive functioning. They also avoid any common fillers. Training a puppy can be one of the most rewarding and bonding experiences. It’s important to give your dog a treat when they do something good. 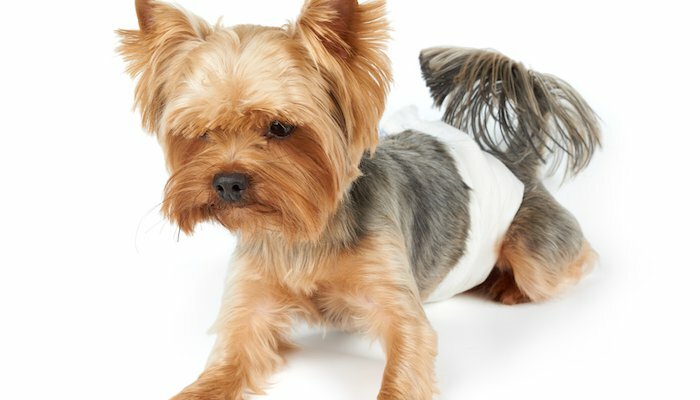 Wellness puppy bites are a perfect food option for smaller dogs and young puppies for multiple reasons. The size and shape of the Wellness puppy bites are very important. Since they have smaller mouths and throats, the healthy treats can’t be too bulky or dense. These natural puppy treats for training are incredibly small squares, making them an excellent choice for smaller dogs. Feeding them multiples of these Wellness Natural Grain Free Puppy Training Treats is an option as well, since they’re low calorie. The natural ingredients in these Wellness puppy bites & training treats for dogs are what makes them a top contender on the list. They’re made of salmon, lamb, chicken, apples, and many more healthy ingredients. You can choose from several different options for dogs, to select exactly what your dog is eating. Healthy ingredients are incredible important, especially in a growing puppy. They need a high amount of protein and healthy fats for strong muscle and bone growth. Another great part about the Wellness Natural puppy training treats is the fact that they use no fillers. Just pure, healthy, natural ingredients. 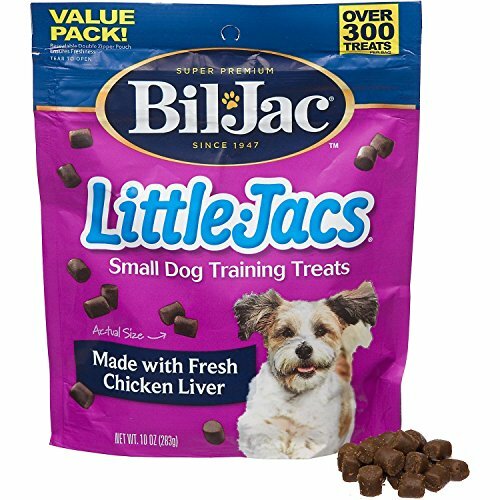 If you’re looking to purchase some dog treats with a trusted, well-known brand, check out the Bil-jac Little-jacs training treats. This company has been around since 1947, and they’ve perfected training treats in multiple ways. From the size to the ingredients, Bil-jac has made some of the best training treats for your dog. The main ingredient in these training treats for dogs is 100% real chicken liver. Instead of starting off with corn, soy, or some other filler, these treats are packed with pure, natural protein. In fact, the first three ingredients all include chicken. They’re also gluten-free, which is great if your dog is allergic to gluten dog products. Just as with humans, some dogs are allergic to gluten which can cause rashes, trouble breathing, and some bowels issues. Instead of testing the waters, Bil-jac training treats allow you to avoid the possibilities. Training any sized dog requires a lot of dog products and treats. Feeding your dog a bunch of milk bones or other larger treats can cause them to get sick, or worse. These small puppy bites can also gain unwanted weight, lose muscle growth (if no protein is given), and lose energy. With these smaller, protein-packed treats, you can reward your pet plenty of times without causing these side effects. If your dog requires much longer training sessions, a.k.a. needs more treats, then check out the Crazy Dog Train-Me mini treats. They have only 1.5 calories per treat, which is some of the lowest we’ve found on the market. Your dog won’t get full on these, which makes them perfect for keeping them excited for more. These training treats for dogs are packed with high-protein ingredients, and contain zero fillers. Since they’re so small, adding any extra fillers would completely alter the taste. Since the company looks after your pet in every way, they didn’t add any corn or other typical fillers. With these training treats, you can choose between bacon, chicken, beef, and salmon as the main ingredient. All of these ingredients are great for growing puppies, and keeping their attention with the delicious flavor. Kids love dogs, but it can be very intimidating to start interacting with one. These small pet treats are perfect for kids to feed to a dog to help them see that dogs truly are man’s best friend. Crazy Dog even has it printed on their label that their treats are an excellent way to introduce your child to a dog in a friendly environment. Why We Like Them – These treats are incredible low in calorie count, which means you can feed them a bunch of them during a training session. Too big of a treat can lead to unwanted weight gain. Blue has been a trusted brand in dog food for many years, which makes it no surprised that their training treats were so well-reviewed. They’re known for their all-natural, healthy dog foods. They brought the same intent into their dog training treats, which is why they’ve ranked so high on this list. Blue uses all-natural ingredients packed with omega-3 and omega-6 healthy fats to promote energy and attentiveness in your dog. They’re super delicious and don’t have any added flavors or fillers. Nothing but pure, healthy ingredients. These pet treats also have DHA, which is meant to improve cognitive function and development in a dog’s brain. Basically, it helps them learn tricks easier and respond to alerts much quicker. DHA is very popular in the dog training business and continues to gain support. 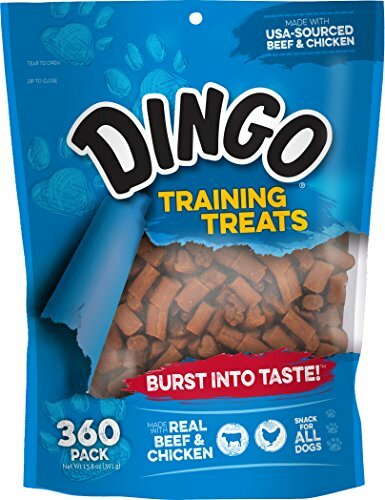 The Dingo Soft and Chewy training treats are probably the smallest ones on the list. They’re smaller than a capsule pill, and they’re great for repetitive mini rewards. These treats also have a delicious natural smoke flavor that your dog can smell from a mile away. With such a strong flavor and aroma, your dog is bound to want to learn. These dog training treats are made with real beef and chicken. Unlike a lot of other brands that mimic these flavors with artificial flavoring, these ones remain all-natural. There’s also garlic oil, for a stronger aroma and flavor. Again, these flavor-packed treats will keep your dog coming back for more. Nothing keeps a dog motivated like delicious treats. Back in the 90’s, a dog named Dingo loved to chew on anything in his way. 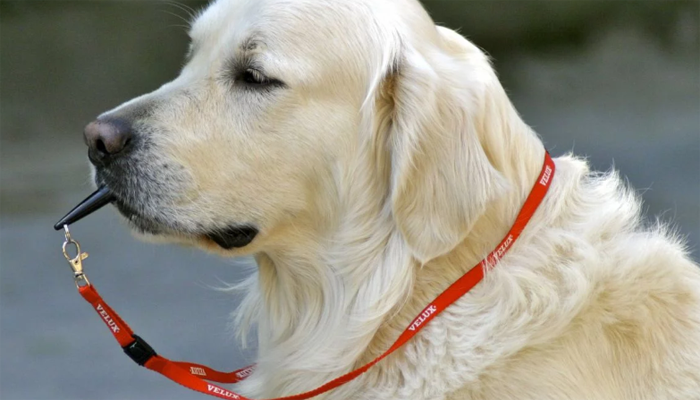 His owner, Les, decided that the best way to prevent him from doing this was to feed him chewy treats as well as giving him an indestructible dog toy to chew in the meantime. Dogs and puppies love to chew, which is why they chew our shoes and wallets. Les figured that the best way to deal with this issue was to give Dingo exactly what he wanted: dog chews! Why We Like Them – The soft texture of these dog treats makes it easier for your dog to chew and digest. The chewy texture is very satisfying for dogs who typically chew on shoes, furniture, and other household objects. Blue Wilderness Trail Treats perfectly embodies what dogs truly are: relatives of wild wolves. With plenty of natural meats and no fillers, these treats are meant to satisfy any type of dog. 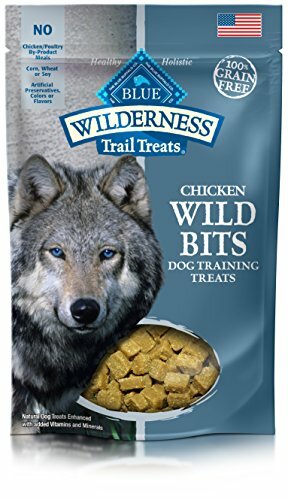 As with most of Blue’s treats, there’s no artificial flavors or artificial colors in these Blue Wilderness Trail Treats. They’re 100% grain-free, which is great to help your dog avoid gaining unnecessary weight. These crunchy dog treats are packed with protein and other wholesome nutrition from salmon, chicken, and sweet potato. They also have flax seed, which provides a healthy dose of omega 3 and 6 fats. Fats are necessary to keep your dog in healthy shape, and to keep their cognitive health peaked. 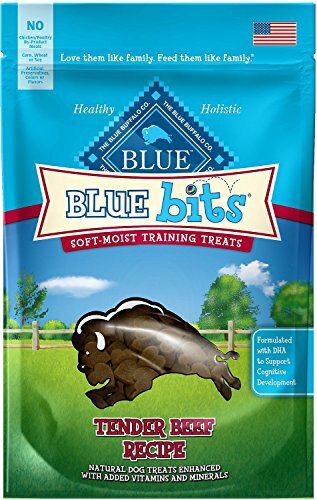 Blue Buffalo Blue Wilderness training treats are crunchy as opposed to the common soft training treat. It’s good for your dog to feel a crunch when their eating, because it feels more like a natural food. In the wild, dogs don’t eat soft, bland food. They eat salmon, chicken, beef, and similar foods which are all found in Blue Wilderness treats. Why We Like Them – Blue’s Wilderness crunchy dog treats are excellent for any dog. They focus on what wild wolves eat: Meat, without any added fillers or artificial flavors. If you’re looking for a soft-chew, protein-based dog training treat, then check out Cloud Star Chewy Tricky Trainers. They’re perfectly sized for any dog, since they’re about the size of a pea. Receiving treats of any size is a reward to a dog, so they can’t tell the difference even if it’s super small. 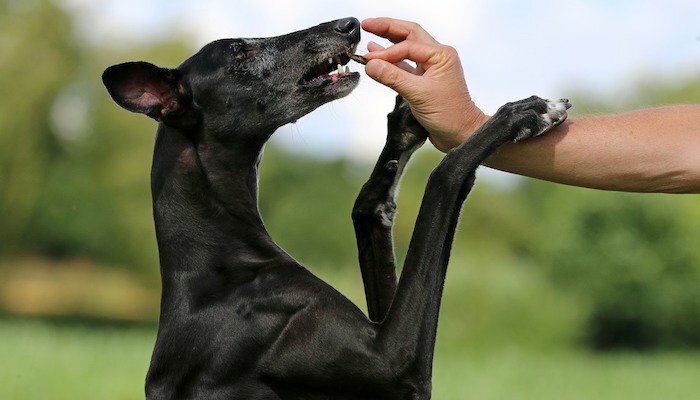 Instead of bulking your dog up with massive, filler-stuff treats, you should aim for smaller, protein-packed bites. 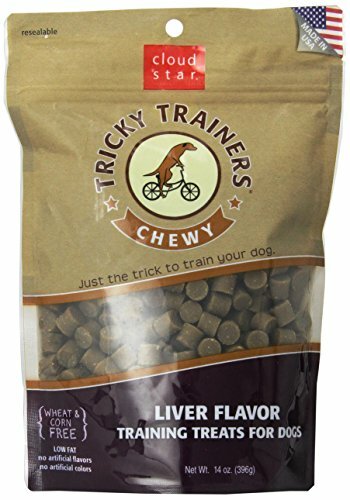 These liver dog training treats are made with chicken liver as their first ingredient. They also contain zero traces of common fillers like corn, soy, and wheat. Another interesting ingredient that they have is maple syrup. Maple syrup provides a sweet taste, which keeps your dog coming back for more. As with many of the natural dog treats on this list, these liver dog treats contain no artificial flavors or colors. They’re also very low in fat, which means you can feed a ton of these to your dog while training without worrying about making them sick to their stomach, or aggravating sensitive stomachs. Take them in your dog treat pouch and head out on a healthy walk! Make sure you’ve got some dog booties to protect the paws! Why We Like Them – These little training treats are incredibly small, making them perfect for dog owners to give to their dogs of all shapes and sizes. Puppies especially can’t digest a whole lot of food at one time, so these small treats are perfect for training sessions. All the dog treat options might seem like they just blur together. Is there really a big difference between them? Absolutely, there is. Before choosing a brand at random, there’s a few things you should take into account. Below we’ve listed plenty of specs to look for when choosing the training treats for your dog. 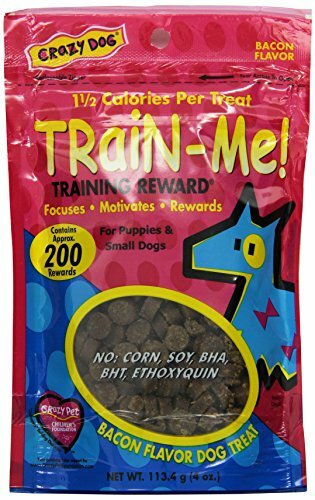 Dog training treats are unique from other types of treats. Regular milk bones and other large treats won’t do, because they can cause all kinds of weight gain and health problems. So what can you use for dog training treats? As far as size goes, you need smaller dog treats for training sessions. When teaching your dog a new trick or lesson, you’ll have to reward them several times so they know that their doing a good job. Smaller, low calories treats are your best option. All of the options for dogs on the list are relatively small and great for these extended training sessions. You also want to make sure that the treats are high in protein. Luckily, most of the treats on the list have protein as their first ingredient. Sources like salmon, chicken, and beef are excellent options for dogs. Yes, the KarmaTreats at #1 are vegan dog treats. These are a great option looking to keep their dog on a vegan diet or limit their meat intake from treats. Too much meat can be a bad thing over time for a dog’s organs, just like with humans. Vegan dog treats are packed with healthy vegetables that help promote cognitive growth and an easier learning process. Instead of just cramming 100% meat in a dog treats, many companies are starting to lean towards vegan or mostly-vegan dog treats. This helps increase a dog’s overall lifespan and reduces the chance of health problems. 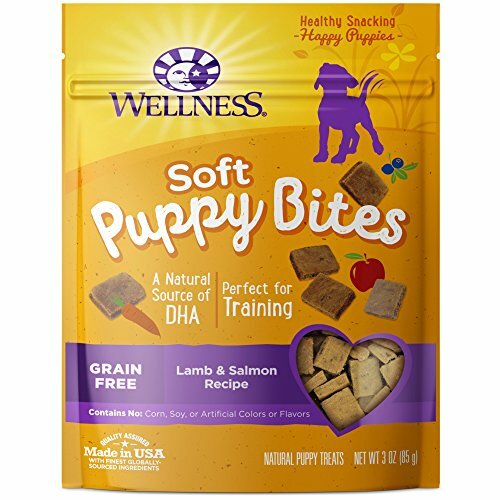 Although many of the dog treats on this list are good for training puppies, the Wellness Natural Grain Free Puppy Treats at #4 are the most ideal. Puppies have small mouths and developing dogs teeth, therefore they need small, soft treats. Keep them clean with these dog toothpastes. These treats are made with all kinds of natural protein like pork, salmon, and chicken. Sources of protein such as these are very necessary for muscle growth and brain development in a growing puppy. It’s known that dogs love to be rewarded all the time. They live to make you happy and love it when you feed them healthy, natural treats. It’s important to feed your dog healthy food, especially when they’re a puppy. Their muscle development, cognitive functioning, and overall health depend upon the food you feed them. Most other dog treats have all kinds of unhealthy fillers that just make your dog gain unhealthy weight. This leads to future health problems, slowed muscle growth, and drowsiness. Feeding your dog with treats that are protein-packed is essential. In the wild they eat a high-protein diet of fish, poultry, and beef. Following this diet is the best way to promote a healthy lifestyle. Training treats are the best way to reward your dog while teaching them new tricks or behaviors. They’re specifically made to be eaten in high quantities so they don’t gain weight. Reward you dog for learning with some delicious, all-natural dog training treats. Dogs respond well to training with physical touch. Tap the back of their paw when teaching them to shake your hand, and tap their nose lightly to teach them to let go of something. Dog treats were first invented in the 1860’s. Prior to this, dogs would eat table scraps as treats!